The 2019 CAHA Player Development Tryout was held April 12-14, 2019 at Extreme Ice Center in Indian Trail, NC. Tryouts were open to all male U.S. citizens born in 2002, 2003, 2004 and 2005, who are legal residents of North Carolina or South Carolina. Meet the Newest Member of the LA Kings: Aiden Rose of Charleston, SC. Click here to read the full story and watch the video on the LA Kings website. The CAHA Board of Directors is currently in the nomination process for two (2) Director openings in North Carolina and one (1) Director opening in South Carolina. Any Registered Participant Member of CAHA may nominate himself / herself or any other person who resides within the geographic district of the open Director position(s). Nominations shall be in writing and must include: (a) the registered participant member's name and address, (b) the nominee's name, address, and acceptance statement, and (c) a brief resume of the nominee's qualifications and hockey-related experience. Please carefully read the election rules. Failure to properly follow the rules may void any or all nominations received during this process. All nominations received within the specified time frame and in accordance with the nomination rules will be placed upon a ballot and forwarded to CAHA Member Associations for voting. The 2019 Boys Prospect Tryouts are scheduled for April 12-14, 2019 at the Extreme Ice Center located in Indian Trail, North Carolina. Tryouts are open to all male U.S. citizens born in 2002, 2003, 2004 and 2005. All players must be legal residents of North Carolina or South Carolina to participate. 2002, 2003 and 2004 players selected during the Affiliate tryouts will advance to the Southeastern District National Camp Tryout. 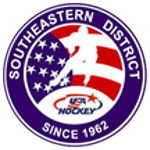 The Southeastern District National Camp Tryout selects players to attend the USA Hockey National Camps and Festivals held during the summer. Twenty (20) 2005 birth year players, 2 Goalies, 12 Forwards and 6 Defensemen, will be selected from the Affiliate tryout to advance to the Southeastern District 14 Camp held annually during the summer. CLICK HERE for more information, schedule and to register for the Player Development Tryout. The Carolina Amateur Hockey Association (CAHA) invites you to participate in our annual Girls' Hockey Festival that will be held at the Greensboro Ice House, on Saturday, March 30, 2019 with Special Guest Tara Connolly, Women’s D1 Coach at RPI. This CAHA sponsored event is open to any female hockey player that has interest in attending. All skill levels are welcome and remember to bring a Friend to the Try Hockey For Free Event (Try Hockey for Free Event has no registration fee). Some equipment will be available for use by new players or have them bring a bike helmet and gloves and they will be set to go! CLICK HERE for more information and to register for the Girls Hockey Festival. CAHA will be hosting their annual CAHA Festival which includes Jamborees, skill development clinics, and lots of fun on the weekend of March 23 - 24, 2019 at Extreme Ice in Indian Trail, NC. CAHA will offer the following: 8U Cross-Ice Jamboree, 8U 4v4 Puddle Hockey Jamboree, 10U Half Ice Jamboree, 10U 3v3 Puddle Hockey Jamboree, two Checking Clinics, Goaltending Clinic, Girls Skills Clinic, and Girl's Jamborees. Click on the tabs below for information on each event. Each Checking Clinic, 8U Puddle Hockey Jamboree, and 10U Puddle Hockey Jamboree requires a separate registration. If you would like to attend BOTH sessions, be sure to register for both. CLICK HERE for more information and to register for an event. Click here for information, locations, all schedules and game results. The Tier II schedule is complete and posted on the tournament webpage. Tier I tryouts can begin the evening of April 10. No tryouts can be held the weekend of April 12-14 (CAHA PD Tryout blackout). CAHA Bylaws, Addendum E, 13. 0 (b) Tier I tryouts may be held 48 hours following the completion of the USA Hockey National Championship Tournaments. Youth Tier II tryouts can begin on May 17. The fifth Friday falls on May 10 (SE District National Camp Tryout blackout) which will move Youth Tier II forward 1 week. CAHA Bylaws, Addendum E, 13.0 (c) Tier II Youth and Girls tryouts may not be held nor may positions be offered to players until the fifth Friday following the completion of the USA Hockey National Championship Tournaments. Should the fifth Friday fall on the start date of the Southeastern District National Camp Tryout, Tier II Youth tryouts may begin the Friday following the Southeastern District National Camp Tryout. Tier II associations that field Tier II and lower competitive level travel teams may hold one tryout within the Tier II schedule timeframe to select all Tier II and lower competitive level travel teams for their association. Associations that include tryouts for lower competitive level travel teams during the Tier II schedule timeframe, must at a minimum, select and register at least one Tier II team in the upcoming season. CAHA Bylaws, Addendum E, 13.0 (g) Youth tryouts may not be held the same weekend as the CAHA Festival or the Southeastern District National Camp Tryout. Girls Tier II tryouts may begin on May 10. Tryouts for associations that form non-national tournament bound Travel Teams or Rec Teams only may begin on July 1. As an additional reminder player agreements or contracts cannot be executed in advance of the appropriate tryout start date as noted above and all offers made to players following a tryout must remain open a minimum of 48 hours. CAHA Bylaws, Addendum E. 13.0 (j) Player Agreements/Contracts: A Member Association shall not have any player or parent execute an association/team player agreement or contract for the next hockey season prior to the appropriate tryout dates listed above. Offers for a position on a team must be held open a minimum of 48 hours following the extension of the offer. Players shall not be required to execute a player agreement or contract until 48 hours have elapsed from the conclusion of the Association’s tryouts or date of the Association’s offer for a position on a team, whichever occurs later. Effective as of the 2017-18 season, no youth or girls Tier I or Tier II team may recruit or solicit players or offer hockey contracts to players for the following season, or hold development camps, tryouts, player selections or any activity that could be construed as a tryout/solicitation or recruitment for the following season, until 48 hours after the last game of Youth National Championships (both Tier I and Tier II Nationals must be completed). For example, if the National Tournament ends at 4 pm on Monday, tryouts can begin after 4 pm on Wednesday. Any violation of this prohibition may subject the coach, team, program and/or responsible administrators to appropriate discipline, or ineligibility of the team or coach, as determined by the Affiliate. If you have any questions, please contact any member of the CAHA Board of Directors.